The switch from the life of a full-time teacher to a full-time wife and mother was hard. Before, I had managed classrooms of at least thirty kids and delegated responsibilities in afterschool clubs, and now I changed diapers and fed babies. Before, I had attended meetings and strategized plans for student success, and now I meal-planned and folded laundry. Before, I had run clubs, sports teams, and classrooms, and now I lived a private life with my small children and daily chores. Who was I, now that I wasn’t contributing something valuable and tangible to the workforce? What grand accomplishments did I have to share after a long day of child-wrangling and disciplining? When my husband came home, my reports included updates about organizing the pantry and keeping the toddlers out of the street (which is a heroic task, depending on the kid—let’s be honest). As difficult as that work was, I struggled to see the value of my role as an at-home mother in the same way I was able to see the value of my work at the school. I liked my job, my coworkers and the strong sense of accomplishment I felt at school, but my work at home was more…well, complicated. I loved my children, of course, but I struggled with knowing how to use my God-given talents when I was living a life so hidden and obscure. I also didn’t anticipate how bored I would feel sometimes while toddlers ransacked my house. The monotony of filling sippy cups and doing laundry and changing diapers came as a surprise to me. I didn't realize I would not be intellectually challenged like I was in college, graduate school or when I worked professionally. I quickly realized if this whole at-home motherhood thing was going to work, I needed to find something to do outside of taking care of my family. I needed a hobby—an interest to engage me while I fulfilled my main responsibilities. I took an inventory of Things I Might Like To Spend Time Doing So I Don't Lose My Mind (or something like that) and one of those things turned into a blog. For over a decade, I wrote on my online journal, telling funny stories or sharing spiritual insights I had. and while I burned dinner. I wrote and wrote and wrote and over the years, my writing got better. I joined a Writer's Guild, went to a few conferences, read some writing books, made some contacts, and published a few things online and in print. Ok, Great, you might be thinking, you found a hobby you enjoyed, devoted some time to it and it all worked out? What’s the big deal, Colleen? Well, the problem with my hobby was I felt guilty devoting time to it, I felt like I was a negligent parent. One of my biggest character defects in my tendency towards black/white, right/ wrong thinking and this type of thinking most certainly affected my ability to enjoy a pursuit I loved. In my mind, a good mom was All In. I wondered if my writing time was too self-indulgent; shouldn’t I just devote myself to raising good kids instead of writing about raising good kids? The result of this type of thinking was I wasted a lot of emotional energy because I was so fearful I was warping my kids while I worked. I thought they would feel slighted by my desire to write or that they would feel they weren’t important enough. I worried about this to such a degree that it robbed me of some of the joy of writing because I thought I was being selfish and self-indulgent. When the worry would reach a fever pitch, I’d pull back, shut my computer and go about my day. I’d abandon my writing for a few weeks or maybe even a month, but I always went back to it. The kids would so or say something so outrageously hilarious or sweet or God would knock me over with a spiritual insight so deep, I felt compelled to share it. I’d type up an article and it would be published, in spite of me I often felt, not because of me. Even though I worried about how I spent my leisure time at home, I couldn’t ignore the fact I felt called to write and to improve in my craft. I sincerely enjoyed the process and even enjoyed reading about writing, but I also felt I never did enough to develop my professional skills. Instead of feeling confident in my decision to plug away as best I could when I had the time, wherewithal, and energy, I worried about all I wasn’t doing professionally. There is so much “advice” out there for writers today that it’s overwhelming. There are online classes on how to grow your audience, how to be a better writer, and even how to be a social media maven, but I didn’t know how to balance my time writing, promoting my work, and taking care of my children. So, I wrote and didn’t focus all that much on the other recommendations mainly because I didn’t have the time...yet I still felt like a failure, like I wasn’t doing all I should do to grow in my field. I judged my work harshly and was hard on myself for not being more organized, professional, goal oriented, etc. I felt pulled in both directions: pulled to focus exclusively on my family and pulled to develop the talents God gave me and I wasted a lot of time worrying. 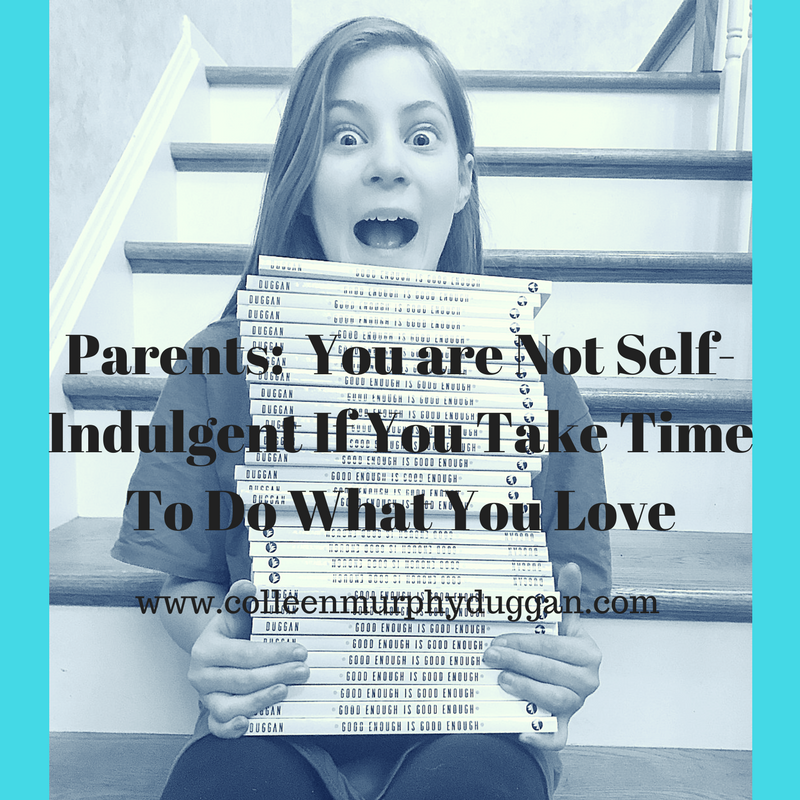 Even though I was unsure, I plugged away at both: parenting my kids and writing. Eventually, after many years of practice, Ave Maria gave me permission to write a book for them, despite my fears and limitations about all I wasn’t doing enough on all fronts. Of course, there were plenty of things I should have focused on before I had the opportunity to write a book. I’m not as well known in the Catholic writing world as I could be…and I know it. But in the end? It didn’t matter all that much. The publisher took a chance of me because they believed I not only had something to say but I had the ability to communicate it (which was the skill I really focused on honing all those years I sat at my desk banging out blog posts). I used all the time I had to do what I could and I let go—however imperfectly—of the time I wanted to have to “develop” myself more and better. When it came time to submit my proposal, the publishing company saw that my skills and platform were not perfect, but they were Good Enough. Put in the time when you can, work hard, read a lot, develop your talent and then leave the rest to God. If you truly are doing His work, He will see you through to the end. Don’t waste your emotional energy worrying about all the things you could be doing to be a better writer, to be more well known, etc. And don't waste time worrying you are warping your kids by developing your own talents. Do what you can and leave the rest up to Him. A few weeks ago, the publisher sent me a box of my new book and I handed each of my six children a copy. “This one if for you,” I told them. They stared at my name on the cover. My girls hugged their books to their chests. “Can we bring it to school to show our friends and our teachers?” they asked. “Of course you can,” I told them, and they did. When they came home, they regaled me with how impressed their friends were that their mother wrote a book. “She writes thousands,” he said in response. My kids are proud of me and they have celebrated the accomplishment more than anyone I know. And writing renews me in such a way so that I actually HAVE something to give them. If you are a mom who worries about cultivating a hobby that is good for your personal well-being: stop. The truth is, it was so, so good for my kids to see their mom actively engaged in a worthwhile project. The work I do outside of the time I care for them reminds them they are not the center of the world, nor should they be. It wasn’t selfish of me at all to try to discern how God wanted to use my gifts while parenting my six children. In fact, he put that very desire in my soul. I have something to say because He gave me the inspiration. It would be wrong for me to ignore it or minimize the call. He wants me to parent my children, yes, but he also wants me to serve my larger community and I want to answer his call. I don’t have to live either/or; I can choose both/and! The world tells women that motherhood, if you let it, will rob you of your identity and your body, your mind and your intellectual pursuits. And while there is a hefty dose of self-denial that comes with it, mainly motherhood has enriched me as a person. It's made me a better version of the young girl who married John fifteen years ago. If you let him, He'll show you too. Now, Go, Set The World On Fire. I want to see what you can do.